» “Blade Runner” Future: Is It Here Now? 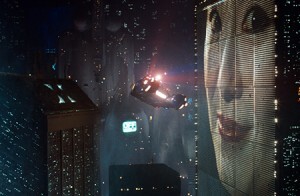 “Blade Runner” Future: Is It Here Now? People driving or walking at night past the AT&T building in downtown L.A. this week may have seen multi-story color images projected onto the building and wondered what was going on. This was a test run by Illumenight, a company that specializes in “projection advertising” and showcases on its website a number of simulations, including grand-scale projections on such buildings as Disney Hall and the historically-registered Hollywood Roosevelt Hotel. Until now a phenomenon primarily confined to music concerts and other special events, projection advertising appears poised to jump into public spaces in a big way, if industry hype is to be believed. Here are sample quotes from promotional materials on two L.A. companies’ websites. “Imagine your ad – 100′ tall – scrolling across a building. Now picture this scene during evening rush hour. Tens of thousands of eyes looking at your glowing ad.”-Kinetic Lighting, Inc.
Supergraphics are currently illegal in L.A. except in very limited circumstances, such as sign districts, and in any event would require a building permit. Read this newspaper article about projection advertising in the city of Ventura.